Oak Park Pool offers a competitive swim team for girls and boys from 6 & Under up through age 18. While our goal is to win each and every swim meet, our primary objectives are teamwork and sportsmanship - with an emphasis on cheering and having fun! During practices, we work on individual skills and will have a specific goal for each swimmer to accomplish that week. And we have a mentoring program between swimmers, so that each individual has someone who can support them in their growth. 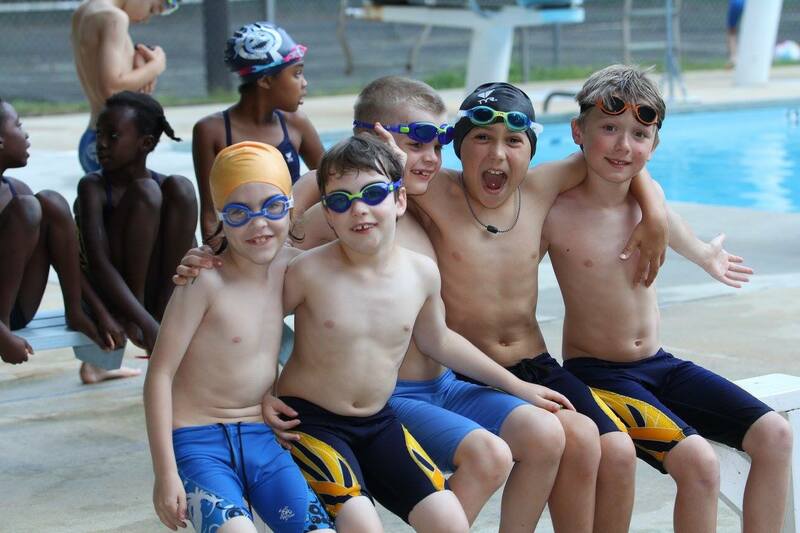 Our goal is to encourage a lifelong love of swimming while building memories and friendships! In addition to practices and swim meets, we also have a variety of extra-curricular activities throughout the summer. We do a yearly lock-in at the pool, with everything from a silent synchronized swimming contest to making chocolate chip pancakes in the morning. We also take a team trip to Emerald Point Wet 'n Wild in Greensboro and have a "secret" parade at our last home meet. Swim team orientation will be on May 7th from 6:30-7:30 at the pool. A swimsuit representative will be there for those who need to purchase swimsuits or equipment. We ask that everyone please register online prior to the orientation by using the link Register Online Here. You can either pay online when you register, or print your invoice to turn in with a check. Teamsnap *We have TeamSnap access by invite only to protect your children's information. Please contact Kathy to be sent a link to join. Swim Team Sign Ups *you must use your family login to be able to register! To keep track of the schedule and other important team-related information, please ask Karen to create a profile on TeamSnap for you so that you can accept an invitation to join! *You are not able to sign up for TeamSnap by yourself. We are a closed group by invite only to protect your children's information. Click the piranha below to learn more about our expectations of our swimmers and parents. The swim team will have a concession stand during each home meet. We ask each family to bring two dozen individually wrapped snacks or backed goods to sell at the concession stand. Cookies, cupcakes, individually packaged fruits, trail mix and popcorn are always great sellers. Proceeds will benefit the team and help offset expenses. In order to have a successful meet, we need volunteers at every event, whether home or away. We need help with timing, hospitality, running the concessions, preparing ribbons, and many other activities. Read here about the various volunteer positions, Guidelines for Clerks of Course and Guidelines for Timing. We require that each family (at least one parent) help out for at least 3 of the 6 meets. And more is better! Most jobs require no experience and friendly on-the-job training will be provided. If you have signed up for a job and are unable to be at a meet as scheduled, please be sure to find a replacement. Parents with only a 17-18 year old swimmers are exempt from volunteer requirements. 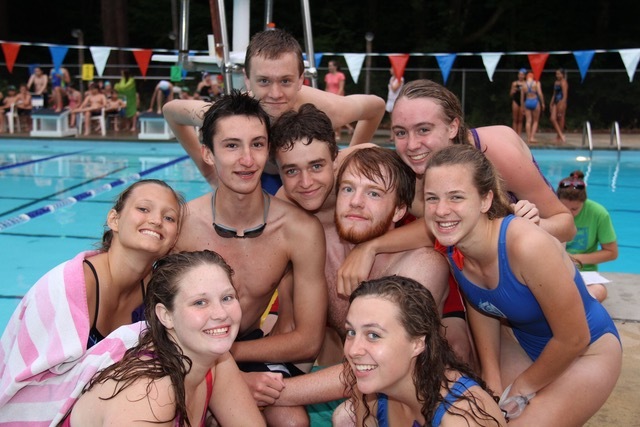 Joining the swim team costs $80 for the first swimmer who is 14 or younger or $50 for the first swimmer aged 15-18. Additional swimmers belonging to the same family cost $50 each. They are capable of swimming across the deep end of the pool without assistance. If they are 7 or older, they must be capable of swimming the length of the pool (25 meters) in order to practice with their age group. Those who do not meet this requirement may join the team and practice with the 6 & Under group, but they will not swim in meets. To ensure that each team member meets these standards, we will hold a swim test for all swimmers at our first time trial session. Children may join the team at any point during the season once they meet our requirements. Swimmers will compete in the age group they fall in on June 1. Swim meets take place on Tuesday nights and begin at 6 pm, rain or shine. Home meet warm-ups are from 5 pm until 5:30 pm; please arrive at 4:45 pm. Away meet warm-ups are from 5:30 pm until 6 pm; please arrive by 5:15. The order of events at each meet is: medley relay, freestyle, backstroke, breaststroke, butterfly and free relay. Each event alternates boys/girls and begins with the youngest age group. 6 & Unders who are officially on the swim team (can swim across the deep end unaided) swim at the meets. The meet schedule for them is freestyle, backstroke, and breaststroke - covering 15 meters. 7-to-8 swimmers and 9-to-10 swimmers swim 25 meters and 11 & Older swimmers swim 50 meters. Meets typically finish between 9 pm and 10 pm. At swim meets, each team will be assigned a certain area to stay in while waiting to swim. Please stay with the team, cheer for your teammates and listen for your event to be called. When leaving at the end of each meet, please pick up your trash. We want to be remembered as good sportsmen and thoughtful guests. If you are unable to participate in a meet, please let your coach know as soon as possible. It is difficult to make changes to the roster at the last minute. When visiting the store just say you are on the Oak Park swim team and they will give everyone the same discount as they provided at the registration. The Cary store is open 10-6 Monday through Friday, 10-4 Saturday and closed on Sunday. They also have a satellite store in North Raleigh that is open on Tuesdays and Thursdays only from 10:00 to 6:00. The North Raleigh Championship Meet will be on 14 July. Click here for more information.